Now it's laready at the end of February, the sunshine is just like that of spring. Hanging baskets of Impatiens above the Buffet Restaurant are in full bloom at this time of the year. 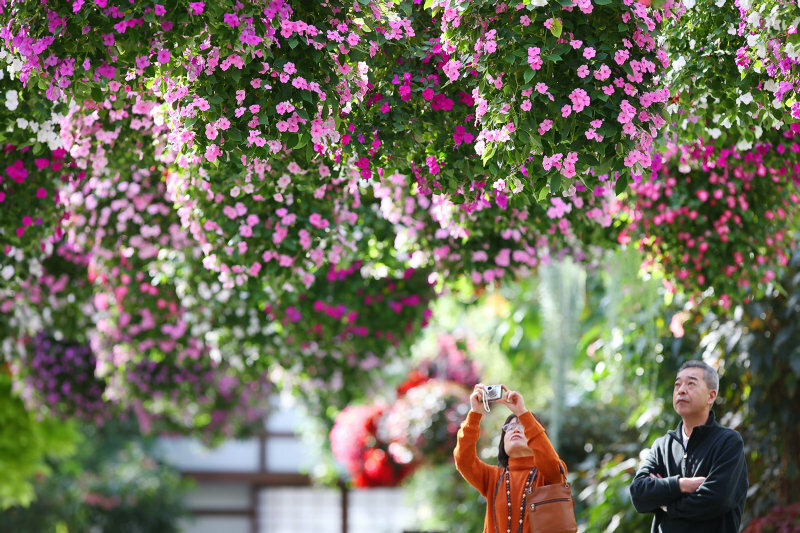 It is the case with this year as well, baskets of Impatiens grown in huge balls decorate the space above visitors in the Main Greenhouse. 2월도 다 지나가고 해빛도 점점 더 따스해오고 있습니다.이시절,온실내의 임파첸스가 가장 아름다운 시기를 맞이해 왔습니다.올해도 풍만하게 봉글봉글 핀 임파첸스가 온실내의 천정을 장식하고 있습니다. 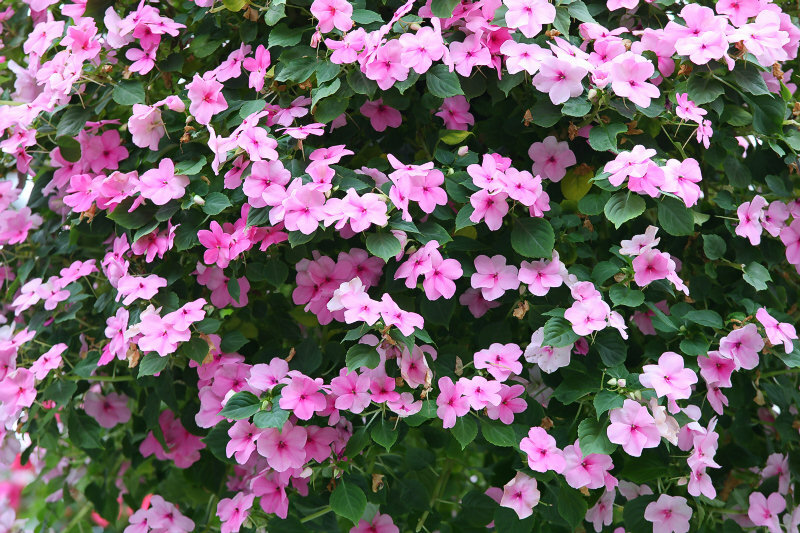 Impatiens, a common plant at garden centres as garden plants in spring, is introduced in the Garden around 2007 taking an advantage of its easy and long bloom, more heat and cold tolerant nature than Tuberous Begonias etc., and by spring in 2008 it has become main plant in the Main Greenhouse. 임파첸스는 봄화단용식물로 홈센터에서도 판매되고 있는데 꽃이 많이,오래 피고 구근베고니아보다 추위에 견디는 능력도 강한 등 좋은점이 있습니다.당원에서는 2007년쯤에 수입하여 2008년 봄부터는 대온실의 메인식물로 되였습니다. 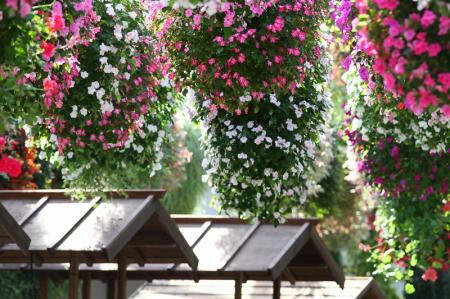 About 1,200 hanging baskets of plants are hung in the Main Greenhouse, of which 800 are Impatiens. 이 대온실의 머리위에는 약 1200포기의 식물이 걸려 있는데 그중에서 임파첸스가 800포기 있습니다. Moreover, the condition of the flowers is much improved now compared to last year. 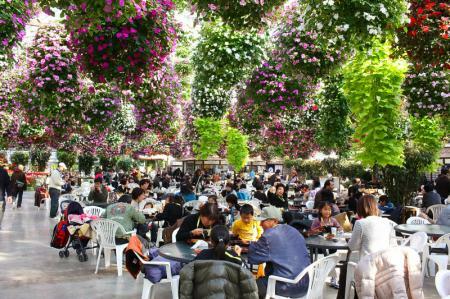 It was because the techniques that plant staff members invented, about artificial illumination system and pest control, in order to realise the aerial flower garden indoors where no sunshine is available at a pavillion in Shanghai Expo 2010 from May, were applied in the Garden as well. 올해는 지난해보다도 더 예쁘게 피였습니다.이것은 올해 5월부터 시작되는 상해세계전람회에서 해빛이 전혀 들어오지 않는 실내에서 이 카케가와화조원의 임파첸스풍경을 재현하기 위해 식물스탭이 인공조명기술,인체에 해로운 약재를 사용하지 않고 병충을 막는 새로운 기술을 개발했습니다.그 노하우를 카케가와화조원의 이 온실의 식물에 사용한 것입니다. Many visitors are impressed with gorgeous aerial flower carpet. 머리위를 장식하는 훌륭한 꽃에 손님들도 저도모르게 감탄을 하시군 합니다. 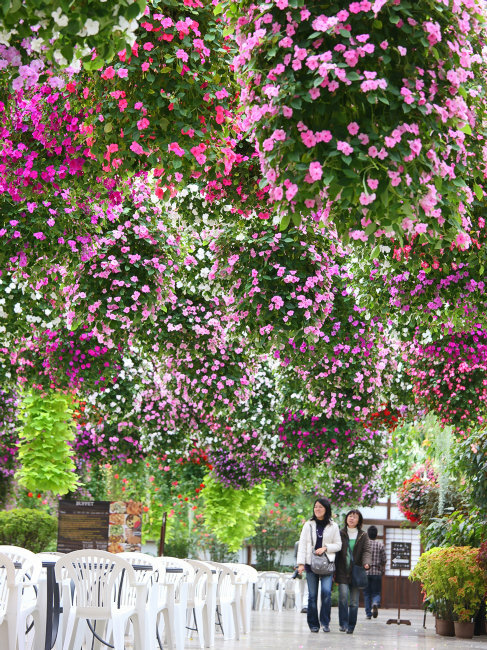 These aerial garden of Impatiens keep in full bloom for a while. Though their best season will be in late March, they are already beautiful enough right now. 이 머리위의 임파첸스는 지금부터 한동안 가장 아름다운 상태를 유지하게 됩니다.꽃이 가장 아름다운 시기는 매년 봄인데 지금도 기가 막히게 아름답습니다.